Spellois a beautiful little medieval town and it’s located on the lower southern flank of Monte Subasio. Populated in ancient times by the umbri, it became a roman colony in the I Century B.C. Under the reign of Constantine the Great it was called Flavia Costans. 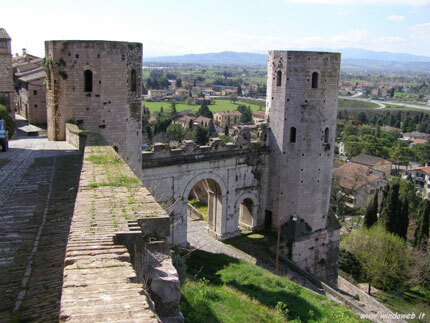 The town is enclosed in a circuit of medieval walls on roman foundations, including three roman gates: Porta Consolare, Porta di Venere and the Arch of Augustus. There are many important churches, many of which dating back to medieval times. Santa M. Maggiore probably was built over an ancient temple dedicated to Juno and Vesta. The façade has a Romanesque portal and 13th century bell tower, while the pilasters next to the apse have some frescoes by Perugino (1512). 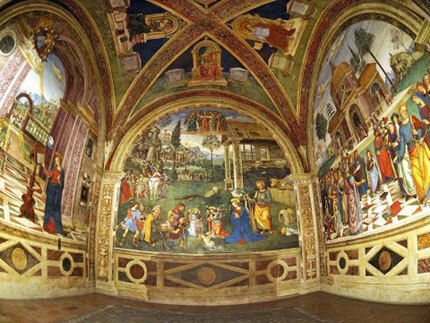 The most striking feature is the Baglioni chapel, frescoed by Pintoricchio. The Umbrian artist was asked to paint it around 1500 C. by Troilo Baglioni, after he had just finished the Borgia apartament’s decoration. His masterpieces include: The Annunciation, the Nativity, the Dispute with the doctors and four sibyls in the vault. The Palazzo dei canonici, annexed to the Churc, houses the town’s art gallery. We can continue the tour visiting the church of S.Andrea, built in 1025, with a lot of frescoes from the XIV to the XVI century. In the right arm there’s a splendid altar piece of the Madonna and child with Saints by Pintoricchio and Eusebio and S.Giorgio. In front of S.Andrea, the roads via Torri di Properzio, descends to porta Venere, the best preserved of roman gateways. At the end we can see the main square with the town hall which houses in the hall an archeological collection. 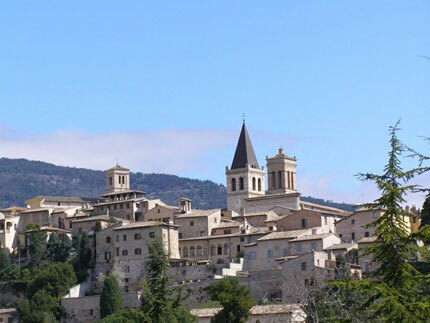 In the upper part of Spello there’s a splendid panoramic view. 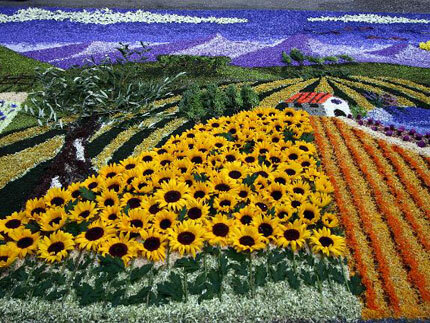 The most important festival of Spello is “The Infiorata”, ruled during the day before corpus domini: streets are carpeted with fresh flowers which look like floreal paintings.